The father of a Washington state high school student who killed four classmates and himself last fall was arrested Tuesday on a federal charge that he was barred from possessing the gun his son used in the shooting. Raymond Lee Fryberg Jr., 42, faces one count of unlawful possession of a firearm by a prohibited person. 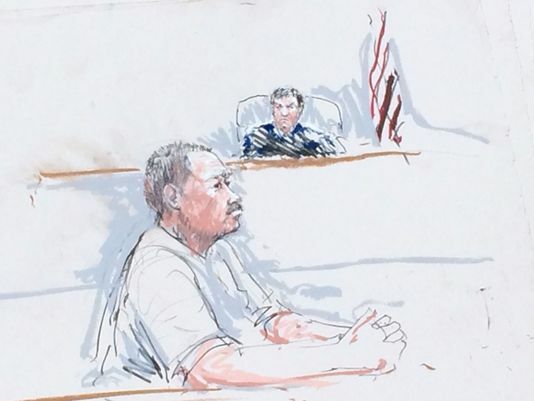 An FBI agent alleged in a criminal complaint that even though Fryberg was subject to a domestic violence protection order, he purchased five guns from a Cabela’s outdoor recreation store, including the Beretta pistol his son used in the shooting, by lying on a federal form. 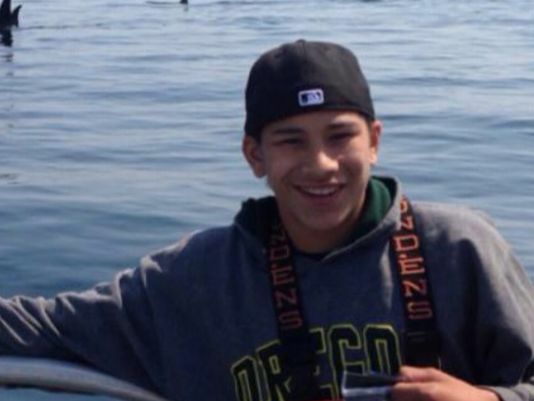 Jaylen Fryberg, 15, a well-liked freshman who had recently been a Homecoming prince, inexplicably shot and killed four friends and wounded another last October after inviting them to lunch in the cafeteria at Marysville-Pilchuck High School north of Seattle. Fryberg was due to appear in U.S. District Court on Tuesday afternoon. Federal court records did not indicate whether he had a lawyer. According to the complaint, Fryberg’s then-girlfriend, the mother of one of his children, obtained a protection order against him in Tulalip Tribal Court in 2002, alleging that he had threatened her, slapped her and pulled her hair. The order became permanent, and in September 2012, Fryberg entered a no-contest plea to a charge that he violated it. He was given a suspended sentence of six months and ordered again to comply with the terms of the order. Just four months later, Fryberg went to a Cabela’s store on the Tulalip reservation and purchased the Beretta, the complaint said. He answered “no” on a federal form asking if he was subject to a court order restraining him from harassing, stalking or threatening a child or intimate partner, and he answered the same when he filled out forms for the purchase of four other weapons at the store between January 2013 and July 2014, the complaint said. State Sen. John McCoy, a member of the Tulalip Tribe, said he didn’t know Fryberg had been subject to a restraining order. MARYSVILLE – More than a hundred people attended an interfaith prayer service held in the Marysville-Pilchuck High School auditorium on Tuesday, February 24. The event, organized by Reverend Terry Kyllo with the St. Philip’s Episcopal Church in Marysville, and Father Pat Twohy, director of the Rocky Mountain Mission for the Northwest Jesuits and who has a lengthy history of chaplain services in the Tulalip community, was designed to bring together the diverse cultures represented in the Tulalip/ Marysville communities during this time of healing. The event was held on the four-month anniversary of the October 24 shooting at the high school where Tulalip tribal member Jaylen Fryberg killed four of his classmates leaving behind one survivor, 14-year-old Nate Hatch, also his relative. Killed were 15-year-old Andrew Fryberg, also related to the shooter, Zoe Galasso, Gia Soriano and Shaylee Chuckulnaskit, all 14. Faith leaders representing many traditions in and around Tulalip and Marysville including Christian, Buddhist, Muslim, Jewish, Sikh, Baha’i and Unitarian welcomed Tulalip/ Marysville residents to a time of silence, prayer, encouraging words, and fellowship. Also in attendance were leaders from Tulalip Tribes, who offered a prayer of healing. An interfaith prayer service was held for the Tulalip and Marysville Communities on the four-month anniversary of the Marysville- Pilchuck High School shooting, Tuesday, Feb. 24, 2015, in Marysville, WA. Throughout the service faith leaders shared words of encouragement before offering a prayer. Afterwards each faith leader would place a candle on table creating a circle of light meant to represent the community. Before the service concluded, a moment of silence was held for schools and communities around the world who have experienced the same type of tragedy. MARYSVILLE – “Our community has been shaken, shaken very hard by the events of October 24,” said new Recovery Directory Mary Schoenfeldt for the Marysville School District during a community meeting held on December 11, at Cedarcrest Middle School. The meeting featured two topic agendas. For the first hour parents learned how to help their children process grief during the holidays. 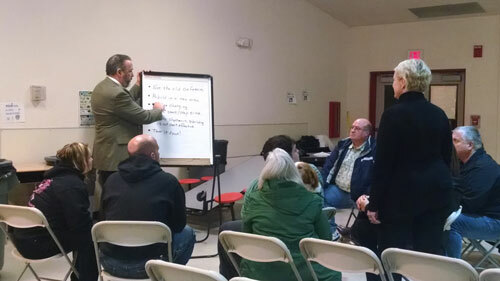 The remainder of the meeting focused on the future of the Marysville-Pilchuck High School cafeteria. 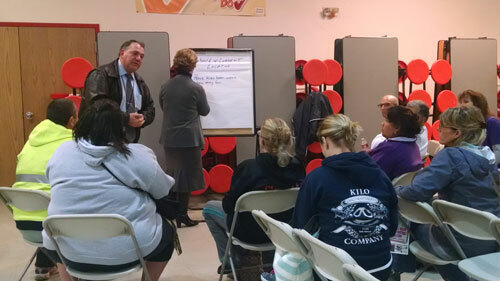 Parents were able to voice their opinions during mini breakout sessions on what the school district should do to move forward. The cafeteria was the location where 15-year-old Tulalip tribal member, Jaylen Fryberg, shot six students, killing five including himself. Since the October 24 incident the cafeteria has remained closed out of respect for students and the victims of the shooting. Now the school district is holding surveys asking the Marysville/Tulalip communities what they would like the future of the cafeteria to entail. Schoenfeldt explained that students might have a hard time coping with the range of emotions that they are experiencing and may not know how to begin a conversation about how they are feeling. Many parents discussed the apprehension their children feel while at the school and trying to settle back into a routine. One mother expressed that her daughter texts frequently throughout the day as a way to cope and that she does not want to eat lunch at the school. “Acknowledge that you are also having a hard time coping with your feelings. Acknowledging it with your child helps to make it a topic for discussion. Be available emotionally to your kids to listen to them,” said Schoenfeldt. Following a brief Q&A with Schoenfeldt, parents were then invited to share their thoughts regarding the status of the cafeteria, which was built in 1970. The school district is seeking state funding to help rebuild the cafeteria. Students temporarily are eating in the gym. “Right now we are just talking, where do we want the kids to eat? It can’t keep being at the gym forever,” said Dr. Becky Berg, Marysville School District Superintendent. To decide if the cafeteria should be completely torn down or remodeled, the district had the community participate in a Thoughtexchange survey on the district’s website. “The intent is to get all our voice to the table and also include the students’ voices,” said Berg. The survey, which closed December 12, will be presented to the board. “The intent of tonight, at this point, is to use these breakout sessions for those who haven’t been online yet and discuss possibilities that we haven’t considered,” said Berg. Many participants expressed they would like to see the cafeteria radically changed in appearance so it would not be such a visible reminder of the October 24 event. Other suggestions included building in a new location, building in a contingency area or simply tearing it down. TULALIP RESERVATION, Wash. – John McCoy stood near Interstate 5 on Tuesday and reflected about what it meant to the reservation nearby. “It was a curtain, definitely a curtain,” said the state senator and tribal leader, about how the road was viewed for years. The highway was a geographic, and figurative, dividing line between the Tulalips and the rest of Snohomish County. McCoy says that has changed as time evolved, but old fears have been re-ignited in the wake of the Marysville-Pilchuck shootings. 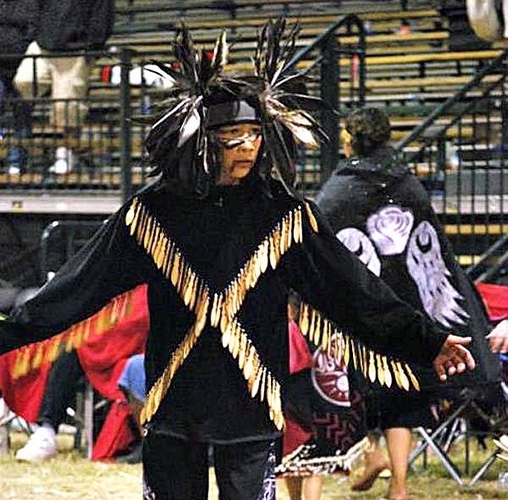 Shooter Jaylen Fryberg was raised by a well-respected Tulalip family, and according to McCoy, was being groomed to be a leader on the reservation. “That’s what makes it really hurt. We felt he was on the right track and doing all the right things. So where did we go wrong, where did we go wrong,” said McCoy, who is close with Fryberg’s family and says they are still trying to process the tragedy. Another tribal member, Andrew Gobin, wrote in The Herald of Everett that he knew Fryberg. Yet, tensions are still high. On Tuesday, police were called to a high school on the reservation after a report of a threat. Police say the threat was unfounded, but stayed at the school for a majority of the day. McCoy says he still sees hope that the event will not renew old beliefs.